This week, we continue a trend from last week: amazing games with very simple rules. We also make good on a promise from the week before that and give you a game with lots of opportunities for aggression against the other players. And all that packaged as a colorful, happy-looking abstract game. Explaining the rules for Blokus is even quicker than it was for Wizard last week. Each player starts with a set of 21 tiles, each consisting of one to five squares arranged into different shapes. 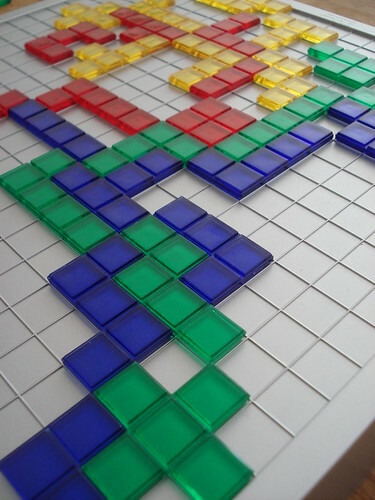 Think of Tetris tiles and you’re close, only that in Blokus all 21 tiles have a different shape. On your first turn, you place one of your tiles in your corner of the 20 x 20 game board. On every turn after that, you place another tile touching the tiles you already have in place, but only at the corners, you may never place your tiles to touch the side of another – touching the sides of opposing tiles is alright. When you cannot place any more tiles, you’re out. When no one can play more tiles, the game ends and points are awarded. Every square left unplayed is worth -1 point – note that it’s indeed every square, so not placing your biggest tiles is -5 points each. Managing to play all your tiles – not something that happens in every game, by the way – awards you 15 points; placing all your tiles and finishing with the only 1-square-tile is worth an unbelievable 20 points. And that, believe it or not, is Blokus. I’m pretty certain there is a bunch of people out there wondering “how is that special?” and even more people asking “where is the promised aggression”? At least, that were my feelings when Sizi introduced me to Blokus some time ago. I learned quickly how wrong I was. Blokus is one of the more cut-throat area control games out there, and you start the game in the middle of the conflict. Everyone tries to claim as big an area as possible early in the game, hoping to the secure the space and fit their tiles in there later. Using your longest tiles you’re in contact with the enemy after the third turn and then things get interesting.Since you can only touch your own tiles at the corner, walling off your part of the board is close to impossible: you always leave an opening for an attack. Instead you have to wall off your opponent’s tile’s corners by fitting a tile around them, or leave gaps where their remaining pieces won’t fit, all that while trying to break through their lines. Where other area control games games often make you wall yourself off and then build inside your wall, in Blokus you need to carefully consider trade -offs between offence and defence. And as if this stab-and-block style of play wasn’t bad enough against one opponent attacking you from the front, Blokus sets you against three other players trying to occupy your precious space. Even when playing with fewer people, all four colours are always in use. This is mainly to always have the same lack of space on the board, but in two players it also opens a whole new can of strategic worms – yet another expression you’re unlikely to hear outside of gaming circles: each player controls two colours, starting in opposite corners of the board, giving everyone more places on the board to keep an eye on and keep the enemy from breaking through. 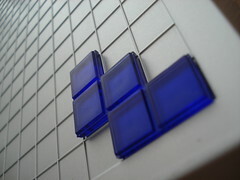 The two-player variant is popular enough that the manual suggests a four-player team variant that plays essentially the same as the two-player game. In this variant, you have one less player to defend against, instead you will want to defend against the other two while at the same time leaving a way for your partner to place his tiles between yours. It’s a completely different challenge from the standard everyone-for-himself rules, but no less fun to play. So as you can see, despite being a hot contender for the game with the shortest rules we presented so far, Blokus has a lot to offer. And the rest of the world agrees with us: Blokus won awards from the French As d’Or to the Japan Boardgame Prize, gaining a spot on the Mensa Select list on the way. Blokus doesn’t come under the heading of “new and unknown” any more, but if you’re interested in very easy to learn, hard to play well and not too time-consuming strategy games, Blokus delivers on all counts.